Photo of Heather by Amy Senecal. Doors open 7:30pm, Show starts 8:00pm. Admission $15 – Buy Tickets! 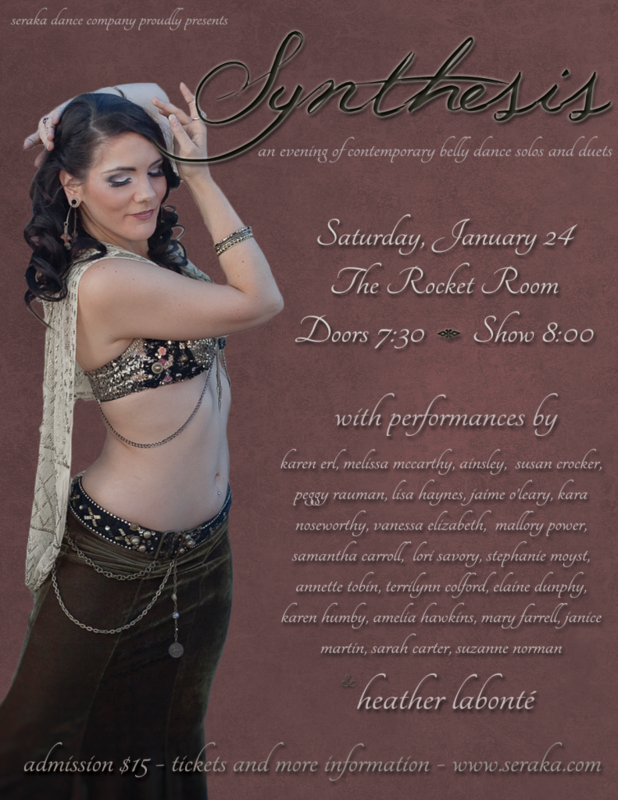 Seraka Dance Company presents “Synthesis: Contemporary” – an evening of non-traditional belly dance solos and duets. This 3rd annual show plays with the idea of melding elegant lines, lyrical or electronic music, and contemporary concepts with belly dance – dancers may embrace the music, the costuming, the expressive nature of the movements, or all (or none) of the above. Peggy Rauman, Lisa Haynes, Ashley Hobbs, Ainsley, Heather Labonté, Stephanie Moyst, Annette Tobin, TerriLynn Colford, Amelia Hawkins, Elaine Dunphy, Karen Humby, Mary Farrell, Jaime O’Leary, Lori Savory, Sarah Carter, Suzanne Norman, Janice Martin, Samantha Carroll, Vanessa Elizabeth, Karen Erl, Susan Crocker, Melissa McCarthy & Mallory Power. “Our third artistic show! In honour of our special guest, Heather Labonté (Toronto ON), this show will challenge dancers to create more contemporary and modern belly dance pieces. As always, the show aims to be a supportive atmosphere for the dancers in the local community, a chance to show family, friends and dance supporters what they enjoy about belly dance, what they’re working on, or what they wants to express creatively. We see many opportunities for dancers to perform in groups, or with performance companies, but rarely do we get a chance to see a dancer perform a solo piece that is uniquely their own; not a piece that is catered to fill a request from a client, but a piece where they can be seen as an individual and not as a member of Troupe-X. This is why we nix the mention of affiliations, and allow dancers from any troupe, school, or group to present a piece as an individual under their own name. Peek at the event on Facebook. Photo by J.Reid Studios. It is Show Day! Online ticket sales are now closed. There is a very small number of seats still available at the door. Admission is $15 per person, payable at the door. All tickets are final sale, and non-refundable. Learn more about our special guest. Photo by Angela McConnell.